Anatomy of an automobile - Visual Dictionary - Copyright © 2005-2016 - All rights reserved. [img]https://infovisual.info//storage/app/media/05/img_en/002 Anatomy of an automobile.jpg[/img] [url=https://infovisual.info/en][/url] - [url=http://www.infovisual.info/]Visual Dictionary[/url] - Copyright © 2005-2016 - All rights reserved. 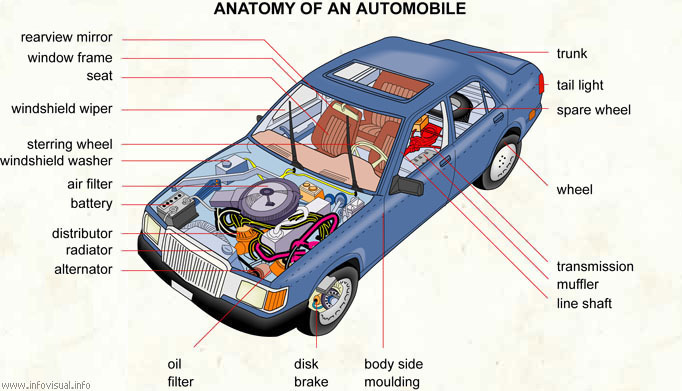 Anatomy of an automobile: road vehicle that is motor-driven and is used for transporting people. Trunk: place for stowing baggage. Spare wheel: wheel of a car used to replace a damaged wheel. Wheel: round object that turns around a central axel and allows the car to advance. Transmission: automobile apparatus that transmits mechanical power to the wheels. Muffler: device used to reduce engine noise. Line shaft: axle on which mechanical power is transmitted to the wheels. Body side moulding: decorative moulding on the side of a car. Disk brake: mechanism that slows and stops a car by friction, by pressing a disk against the axel of a wheel. Oil filter: device that removes impurities from oil passing through it. Alternator: generator that produces an alternating current. Radiator: apparatus that cools the motor. Distributor: case that is used to fire the cylinders. Battery: device that generates electric current. Air filter: device that remove impurities from air passing trough it. Windshield washer: liquid used to clean the windows. Steering wheel: device used to handle a car in conjuction with steering and gear systems. Windshield wiper: movable device, made partly of rubber, that wipes the windshield and rear window of a car. Seat: type of armchair in the passenger compartment of a car. Window frame: border around a window. Rearview mirror: inside mirror used for looking backward.